Item Number : 05528Feature : 2PC PK BASEBALL CHAIR , OTTOMANDimen.. Item Number : 05948Feature : DARK BROWN LEATHER OTTOMANColor :Dim.. Item Number : 08188Feature : CHERRY PHONE ST W/MAGAZINE****Color .. Inches: 43” W x 24” D x 19” HColors:CharcoalStyle:Contemporary.. Inches: 41” W x 41” D x 20” HColors:CharcoalStyle:Contemporary.. Item Number : 15034Feature : TOP+SPLIT LEATHER OTTOMANDimensions .. Inches: 43” W x 23” D x 20” HColors:WheatStyle:Traditional..
What do you get when you mix craftsmanship and style? The Hannalore ottoman..
Pillowy soft goodness is what the Gleason ottoman is all about. With 100% l.. Inches: 33” W x 23” D x 19” HColors:FogStyle:Traditional..
With its tastefully tufted design and DuraBlend® upholstery—providing the a.. Inches: 34.5” W x 34.5” D x 18.75” HColors:GrayStyle:Contemporary..
Dimensions (Confirmed):Inches: 44" W x 24.1" D x 18" HMetric: 1117.6mm W x ..
Dimensions (Confirmed):Inches: 44" W x 23" D x 18" HMetric: 1117.6mm W x 58.. Inches: 29” W x 22” D x 19” HColors:FogStyle:Contemporary.. Inches: 43” W x 24” D x 20” HColors:LinenStyle:Casual.. Inches: 40” W x 24” D x 20” HColors:ToffeeStyle:Contemporary.. Inches: 40” W x 24” D x 17” HColors:SmokeStyle:Contemporary..
Dimensions (Confirmed):Inches: 42" W x 24" D x 20" HMetric: 1066.8mm W x 60.. Inches: 49” W x 24” D x 19” HColors:GraphiteStyle:Contemporary..
A striking centerpiece, the Kumasi oversized ottoman merges highly contempo.. Inches: 31” W x 25” D x 20” HColors:PewterStyle:Contemporary..
38200 Keereel OttomanFrame constructions have been tested with various equi..
38300 Montgomery OttomanInches: 34” W x 25” D x 18” HMore Dimensions:Minimu.. 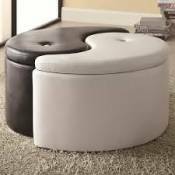 Inspired by penthouse suite living, the Tensas ottoman in “ice” cream faux .. Inspired by penthouse suite living, the Tensas ottoman in black faux leathe.. Inches: 33” W x 23” D x 20” HColors:SteelStyle:Contemporary..
Dimensions (Confirmed):Inches: 43" W x 23" D x 19" HMetric: 1092.2mm W x 58..
41201 Gayler OttomanInches: 29.5” W x 24” D x 20” HMore Dimensions:Ottoman&..